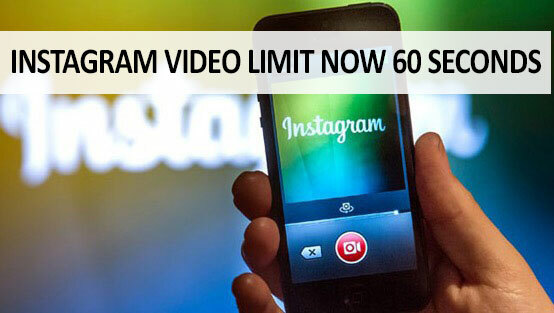 Home » advertising » content marketing » instagram » social media » Instagram's new video limit is now 60 seconds. How can brands benefit? Here is now another change at Instagram. This week, Instagram announced that the maximum length of videos on its platform will be 60 seconds – four times the previous 15 second limit. The increased limit – now a full minute, definitely creates a whole new opportunity for brands. The 15 second limit was crisp, short, and brands needed to be quick in transmitting their message. It called for precise creativity. It also allowed for the 'insta' factor in instagram. Now with 60 seconds, brands have a lot more room to express themselves – hopefully, still, creatively. Instagram have announced that in the last six months, people have spent 40% more time watching videos. This extended format is a recognition of the importance of video for the folks at Instagram. I'm guessing the shift is happening from the importance of filters and tweaks to more solid content in the video format. It also may be an agenda – the 60 second format will allow for more advertising opportunities for brands on the platform and more formats that Instagram can offer. Brands are and will jump on quick. Selena Gomez, a huge brand in music, already has published a 60-second video clip of some behind the scenes action. Brands will surely benefit, but this will mean that video content strategy needs to be thought out well. While the 15-second limit was indeed a limit, it also was a tighter framework – allowing for less inane and boring content. Now with 60 seconds to play with, brands and their agencies need to be a lot more careful, towards producing interesting, engaging, rewarding content that befits the Instagram platform. Brands need to be aware that the new format is not for them to simply re-purpose tv content, so that their posts don't become a bank of their tv spots. That would really turn off fans quickly. One can do a lot in 60 seconds, and this opportunity should not be wasted with boring re-purposed material. Already, just a few weeks ago Instagram have changed to a new algorithm which will determine how you see posts on the timeline. This new 60 second limit will further call for better creativity, more research and insight based content, and hopefully, brands will rise to the occasion. Here's to new thinking: More is more, after all. This is good news for those who can make good video content, otherwise it will be long and boring.